SACRAMENTO (CA) – Mid Major Hoops Report scouting analysts Ladell Hill Jr. and Joey Velasquez were on hand to evaluate talent at the EYBL SACRAMENTO SESSION. We will be posting top athletes that we saw in the Sacramento event. The list of top athletes are named based on game performance and not HYPE coming into the event. We will be posting 2 parts of this report on top performers over the (3) three day event. One of top 2015 Student Athletes in Northern, California, Vinnie Safin of Rocklin HS (CA) has been showing out grabbing attention from college recruiters and media outlets. Mid Major Hoops Report has invited him to our “Players Corner” where we at MMHR are proud to highlight him and allow him to give us insight on his recruitment at this time…. VS: I like to do the dirty work on defense with rebounding, steals and charges, but then I shoot and rebound well on offense. VS: Creating my own shot and ball handling. VS: I want to make ball handling one of my biggest threats. VS: I have an offer from Houston Baptist. High interest from Hawaii, Utah Valley, Boston University, and Air Force. Also Boise State, UC Irvine, Cal Poly, San Diego. VS: Coach Fisher from Hawaii. Coach Condie from Utah Valley, and Coach Kinne from Houston Baptist. Coach Evans from BYU-Hawaii. VS: Not right now, most likely after this summer. VS: I’ve been to Stanford for the Elite camp. Have talked about visits with a few schools. Scheduling those after summer. VS: I want to go where I feel is right. Whether that means close to home or farther away. VS: I am working on my game 5-6 days a weeks. Always in the gym pursuing my dream. VS: Academics, facilities and coaching staff. VS: Get better everyday and signing by the end of 2014. VS: Playing overseas and becoming a college coach. Also providing for my family. Special Thanks to the Safin family for allowing us to interview their son. Please keep us posted and informed on upcoming recruiting information. God Bless! One of top 2015 Student Athletes in Northern, California, Noah Blackwell of Woodcreek HS (CA) has been showing out grabbing attention from college recruiters and media outlets. NB: I see myself playing point guard in college. NB: A lot I’m always in the gym and weight room with my brother and trainer just trying to make it. NB: The coaches and the offense I love a lot of pick and roll cause that’s just something I picked up naturally. NB: My brothers friends family trainer and my grandma who’s up in heaven looking down upon me she makes all this possible out relationship has always been very close. Special Thanks to the Blackwell family for allowing us to interview their son. Please keep us posted and informed on upcoming recruiting information. God Bless! 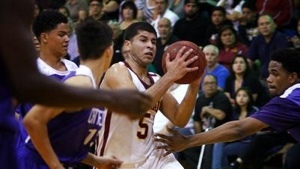 When Montebello Cantwell-Sacred Heart holds its basketball awards banquet, Coach George Zedan should award a hard hat and lunch pail to senior guard Joey Covarrubias for his toughness in surviving a series of defensive assignments against players who one day we’ll be watching on television in college or the NBA. College recruiters might want to set up a one-on-one interview with Covarrubias to hear his personal scouting reports after guarding many of the top players in Southern California over the last four months. Among the players he has guarded this season are Lonzo Ball of Chino Hills, Marcus LoVett Jr. of San Gabriel Academy, Chris Sandifer of Woodland Hills Taft, Khalil Bedart-Ghani of Los Angeles Loyola, Bennie Boatwright of Sun Valley Village Christian, Kendall Small of Lakewood Mayfair, Deontae North of Corona Centennial, Ron Freeman of Gardena Serra, Lucas Siewert of L.A. Cathedral, Michael Oguine of West Hills Chaminade and Stanley Johnson of Santa Ana Mater Dei. That’s 11 standout players who will be playing college basketball in the coming years. His next assignment will be guarding junior guard Stevie Thompson Jr. of Torrance Bishop Montgomery in Saturday’s 4 p.m. Division IV Southern California Regional final at Ontario Colony. Covarrubias said trying to stop Mater Dei’s Johnson was his toughest assignment. “Honestly, I didn’t get any sleep,” he said of his preparation for Johnson. Johnson ended up scoring 17 points, and Mater Dei needed overtime to beat the Cardinals, 66-59. However, Covarrubias found out Johnson doesn’t have any weaknesses. Covarrubias devotes so much energy and focus to defense that sometimes he has to let others score on offense. And yet, he leads his team in scoring at 14.8 points. Cantwell-Sacred Heart is 23-8 and has never reached this point in the state playoffs. One more win and the Cardinals will be playing for their first state championship in Sacramento. One day, Covarrubias will look back on his defensive assignments and probably wonder how he pulled it off. One of top 2016 Student Athletes in Northern, California, Christian Terrell of Sacramento HS (CA) has been showing out grabbing attention from college recruiters and media outlets. Mid Major Hoops Report has invited him to our “Players Corner” where we at MMHR are proud to highlight him and allow him to give us insight on his recruitment at this time…. CT: Our toughest matchups have been Capital Christian, El Cerrito and Bishop O’Dowd. CT: USC, UCLA, Gonzaga, SDSU, St. Mary’s, Sac State, UC Davis, UC Irvine, San Francisco, San Jose, Cal Poly, Arizona, Arizona St, Loyola Marymount, NAU, Bakersfield, Chico State, Washington, Portland State, CSU Eastbay, UCLA, Pepperdine, Cal. CT: USC, Gonzaga,UC Davis, UC Irvine, Washington, , Sac State have all offered scholarships. But Cal, Washington, Pepperdine, USC and UCLA are recruiting the hardest right now. CT: I look for academic program I can fit in to. I look for campus life I love active campuses, student activity and involvement. I look for the style of play and coaching staffs background and credibility. CT: I plan on visiting a lot of colleges unofficially this summer but I have Washington, USC, UCLA and Gonzaga planned so far. Any big time camps or showcases you plan on attending after season? CT: I don’t know at the moment but I do plan on attending any showcase or camp I can. CT: My strong points are my length and versatility. The ability to guard or play virtually every position. My passing and ability to see a play develop before it happens. I can bring out and attack bigger defenders or post smaller ones. My weakness is that I need to work on being a more consistent shooter and I need to get physically stronger. CT: I work out 3-5 times a week. CT: The biggest impact on my life is my family.They support me through my achievements and downfalls. My two parents I owe a lot to. My mom makes sure I am not slacking in school an is always asking and checking on my grades. She makes sure I have transportation to any practice,workout and game. My dad is my athletic caretaker! He critiques every aspect of my game and breaks it down to show me what I did wrong or right. My dad works me out and trains me. He updates me on all high school basketball news to show how blessed I am to be where I’m at and to show how I can get better. I honestly couldn’t be here without those two people! Thank you, for your time and good luck on the rest of your season. Please keep in contact with MMHR to keep track of your recruiting. MMHR ventured to Perris, CA to check out the Icemen’s 6th Annual College Evaluation Showcase at Citrus Hill High School. There was plenty of talent and fundamental skill work observed. 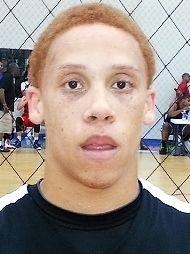 But the cream of the crop was Ashtin Chastain(2015). The big fella, out of Norco HS, measures 6’10” 260 pounds. He has a well put together body. Ashtin is a true back to the basket post player. He posts up strong, has right and left hand baby hooks, and finishes around the basket. Ashtin runs the floor hard, keeps the ball up high, and sets good picks and rolls to the basket hard. He is not a jump out the gym athlete. Ashtin has to get in better condition. Once he does that, his basketball game will go to another level. MMHR: What is your height, weight, and position? AC: I’m 6’10” 255 and I am a center. MMHR: How was your season this year? AC: I think I improved a lot from last year. I learned a lot about the game. I learned my role on the team is to get it in the post and play hard. I executed well in games and had my best scoring season, averaged a double double. Our team is still learning, but we’ll get there. MMHR: Did the season live up to your expectations? AC: It was a good season. We had a little more potential than we fulfilled. It was a good season overall. MMHR: During your season, what team was your toughest matchup? AC: Centennial HS. 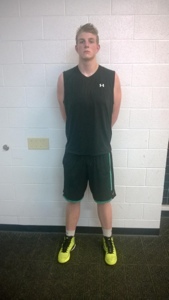 They have 6’8″ and a 6’9″ big, athletic, long guys that are strong and hard to post up. I think I did well. In the first game I had 10 points, but the next game I played good defense and executed better. MMHR: Which college have attended your practices or games this year? AC: None. No one has come up and approached me yet. MMHR: Which colleges are recruiting you the hardest? AC: Cal Lutheran and Minnesota Duluth. MMHR: What are you looking for in a college program? AC: Good work ethic, team that wants to win, and a team that feeds the post. MMHR: Any college visits planned for the off season? AC: This spring break I’m planning to go to Kansas State. That is my dream school. MMHR: Are you planning on attending any camps or showcases? AC: Scoutfocus.com is holding a camp and a couple of things at the Players’ Edge. MMHR: What are your strengths as a player? AC: My strength is my strength. I am a big guy and I throw my weight around. Defensively, I’m an agitator and bang with the other post. MMHR: What are your weaknesses that you would like to turn into strengths? AC: My ball handling is definitely one of my weaknesses. I need to work on being strong with the ball when I am not dribbling and being able to get by players putting the ball on the floor. MMHR: What AAU or travel team will you play with this spring and summer? AC: This spring I will be playing with Icemen with Coach Malecki. This summer is undecided. MMHR: How many days per week do you work on your game outside your normal team practices? AC: Every single day. I am in volleyball right now. After practice, I go to LA Fitness and hit the weights and then I work on my shot and post moves. MMHR: Do you have a Twitter? MMHR: Who has had the biggest impact on your life when it comes to basketball, life, and school? AC: I would say my mom. She has been pushing me my whole life. She recently had a brain aneurysm and a stroke in her coma. She is still working back and she is my motivator. She is why I play basketball. She is my rock. I do everything I do for her. I want to get a college scholarship to make her proud. One of top 2016 Student Athletes in Northern, California, Jordan Ford of Folsom HS (CA) has been showing out grabbing attention from college recruiters and media outlets. 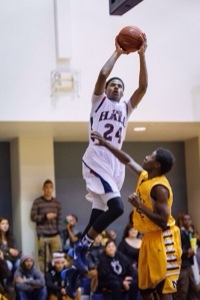 Mid Major Hoops Report has invited him to our “Players Corner” where we at MMHR are proud to highlight him and allow him to give us insight on his recruitment at this time…..
JF: We just won the Sac Joaquin Division Two Section Championship. This is a dream come true. Now we are focused on winning the State Championship. JF: The two games against Jesuit and the playoff Games against Grant and Cosumnes Oaks. Playing Oakridge at there place is a dogfight. JF: A program that is serious about winning. JF: No, but I have visited UC Santa Barbara, Cal, San Jose State, Sacrament State and Northridge. JF: I’m working hard to continue to improve in all areas of my game. Shooting and ball handling are strong points and my defense is improving as my body and experience grows. JF: It depends. I go hard at it in the summer about 6 days a week. During school session my training varies depending on my school load, but at least 2 to 3 times per week. JF: For Basketball it is my Dad and sister, coaches, trainers, teammates, fans and friends. For Life…. my parents are my role model. For School…My mother especially and tutors who help me compete for grades. 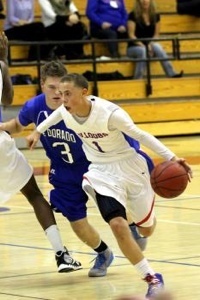 One of top 2016 Student Athletes in Central, California, Colin Slater Jr. of Immanuel HS, Reedley. (CA) has been showing out grabbing attention from college recruiters and media outlets. Mid Major Hoops Report has invited him to our “Players Corner” where we at MMHR are proud to highlight him and allow him to give us insight on his recruitment at this time…..
and Cal so far in person this year in hoops. scholarship offers at this point? 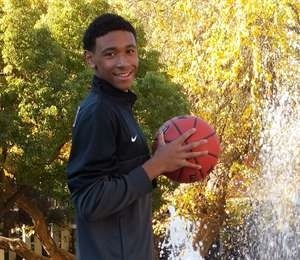 CS: The Schools recruiting me the hardest right now is Tulane, Fresno State, and San Jose State. I am not sure who else is because I don’t get to communicate with many of the coaches unless the visit my practices. I have oﬀers from Fresno State, Tulane, and San Jose State. Which Colleges do you plan on taking visits to in the future? Do you have any big time camps or Showcases scheduled for this spring or summer? to do then just go do it. What are your strong points in your game? And What are your weaknesses in your game that you are working to make them into strengths? making and getting my teammates involved. I have to work on my consistency with my game, I would really love consistency of how I play all the time to be a strength. What AAU team are you playing with this spring and/or Summer? How many times a week are you in the gym working on your game? Do you have a twitter account? So coaches can follow you? Who has had the biggest impact on your life on and off the basketball court? CS: Honestly, the biggest impact on my life so far has to be the people at my high school (private HS) in Reedley as far as my life goes. It truly helps learning about Jesus Christ each and everyday. Basketball someone who had the biggest impact on me has to be Glenn Gaines, when I was losing vision of the toughness and grit I once had in New Orleans, he ignited my passion to be a tough hard nose player. In school the biggest impact I had was my ap world history teacher mr. Thomas and my teacher last year mr. Kantor. Both teachers pushed me a tremendous amount in the classroom and they showed me how hard I could push myself. It made want to learn more and more. 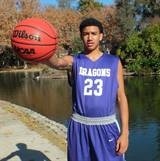 Players Corner: Q&A with Tre Finch (6’1″/Guard/2016/Sacramento HS) Calif.
One of top 2015 Student Athletes in Northern California, Tre Finch of Sacramento HS, Sacramento (CA) has been showing out grabbing attention from college recruiters and media outlets. Mid Major Hoops Report has invited him to our “Players Corner” where we at MMHR are proud to highlight him and allow him to give us insight on his recruitment at this time…..
How is your season coming along, so far? Is it living up to expectations? TF: Season is going great. Learned a ton of new things and added to my game. We won league and getting ready for sections. TF: I am looking for the style of play, Coaches credibility and track record, teammates, and environment of program. TF: Strengths would be my ability to shoot the ball, use ball screens really well, I’m a prolific scorer, and play lock down defense due to my length. My weaknesses would be at times I tend to disappear from the game for a quick half a quarter, my passing needs a little work. TF: Our HS team goes 6 days a week and Coach Doherty always preaches rest so I take 1 day off. One of top 2015 Student Athletes in Northern California, Armani Collins of Stuart Hall HS, San Francisco (CA) has been showing out grabbing attention from college recruiters and media outlets. Mid Major Hoops Report has invited him to our “Players Corner” where we at MMHR are proud to highlight him and allow him to give us insight on his recruitment at this time…..
AC: 6′ 5″, 190, Shooting Guard & Small Forward. AC: Yes. Season has been awesome. We recently accomplished two of our major team goals. 2. & Having a perfect home court season with no losses. Up to this point in your season, who has been your team’s toughest match up? AC: St. Joe’s & Branson. What are sections looking like in your division? AC: We received the three seed which is what we expected. WE also want to reach another team goal by winning a section championship. How have you, your teammates, and your HS team improved from last year? AC: This year we are more like a family not just regular teammates. We have bought into Coach J.’s team philosophy of Toughness & Togetherness. AC: Hard Work. Dedication. Staying humble. And constantly working on my game. AC: Cal Poly has offered. Others that appear interested include: USF, Weber State & Portland University. AC: A school where I fit academically. A school that might provide immediate playing time. To be honest I am open to all schools and find the attention flattering. AC: Not at this point. Any camps or showcases you plan on attending after season? 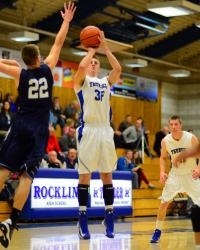 AC: Strenghts: shooting, rebounding, making shots when it counts most and being a good teammate. I have made an effort this year to make all my teammates better. AC: 2-3 days a week. Do you have a twitter account and if so, what is it? My Grade school Coach Coach Mike. My high school coach, Coach J. My AAU coaches Coach Ford, Coach Doherty, Coach Sousa and Jeremy Russotti. Special thanks to friends of and the Collins family for allowing this Q&A to happen for all Mid Major Hoops Reports viewers to gain insight on all recruitment news.